Each time you draw a card(s) for your normal draw in your Draw Phase, place 1 Greed Counter on this card. You can send this card with 2 or more Greed Counters to the GY; draw 2 cards. All Speed Duel .. When you take battle damage while you control no monsters: Gain LP equal to the battle damage you took, and if you do, Special Summon 1 "Malus Token" (Fiend/DARK/Level 1/ATK ?/DEF ?). Its ATK/DEF are .. If you control "Toon World" and a Toon monster: Target 1 card in your opponent's GY; if it is a monster, Special Summon it to your field, or if it is a Spell/Trap, Set it to your field. You can only a.. The ultimate wizard in the terms of attack and defense. All Speed Duel Cards contain a new marker confirming their legality for Speed Dueling. Only cards with this special symbol may be used for Speed..
A playful little fiend that lurks in the dark, waiting to attack an unwary enemy. All Speed Duel Cards contain a new marker confirming their legality for Speed Dueling. Only cards with this special sy..
A deadly doll gifted with mystical power, it is particularly powerful when attacking against dark forces. All Speed Duel Cards contain a new marker confirming their legality for Speed Dueling. Only ca..
Gains 300 ATK for every "Dark Magician" or "Magician of Black Chaos" in the GY. All Speed Duel Cards contain a new marker confirming their legality for Speed Dueling. Only cards with this special sym..
During your Main Phase, you can Tribute Summon 1 Spellcaster monster in face-up Attack Position, in addition to your Normal Summon/Set. (You can only gain this effect once per turn.) If this card is s..
FLIP: Reveal all face-down cards on the field (Flip Effects are not activated), then return them to their original positions. All Speed Duel Cards contain a new marker confirming their legality for S.. This card can be treated as 2 Tributes for the Tribute Summon of a DARK monster. All Speed Duel Cards contain a new marker confirming their legality for Speed Dueling. Only cards with this special sy.. If this card is sent from the field to the GY: You can add 1 Dragon, Warrior, or Spellcaster Normal Monster from your Deck to your hand. All Speed Duel Cards contain a new marker confirming their lega.. If you control "Dark Magician": Target 1 monster your opponent controls; destroy that target. All Speed Duel Cards contain a new marker confirming their legality for Speed Dueling. Only cards with th.. If you control a face-up "Dark Magician Girl": Special Summon 1 "Dark Magician" from your hand or Deck. All Speed Duel Cards contain a new marker confirming their legality for Speed Dueling. Only car.. If you control "Dark Magician": Destroy all Spells and Traps your opponent controls. All Speed Duel Cards contain a new marker confirming their legality for Speed Dueling. Only cards with this specia..
Target 2 face-up monsters on the field; halve the ATK of 1 monster, and if you do, add that lost ATK to the other monster. These effects last until the end of this turn. All Speed Duel Cards contain .. Tribute 1 monster; Special Summon 1 Level 7 monster from your hand that can be Normal Summoned/Set. It cannot attack this turn. All Speed Duel Cards contain a new marker confirming their legality for..
Equip only to a Spellcaster monster. It gains 500 ATK. If you control the equipped monster and this card: You can send both to the GY; draw 2 cards. All Speed Duel Cards contain a new marker confirmi..
Banish 1 random card from your opponent's hand, face-down. During your opponent's 4th Standby Phase after this card's activation, return that card to their hand. All Speed Duel Cards contain a new ma.. When a Spellcaster monster declares an attack: Each player Special Summons 1 Spellcaster monster with 2000 or less ATK from their Deck in Attack Position. All Speed Duel Cards contain a new marker co.. When a Spell Card is activated: Discard 1 card; negate the activation, and if you do, destroy it. All Speed Duel Cards contain a new marker confirming their legality for Speed Dueling. Only cards wit.. 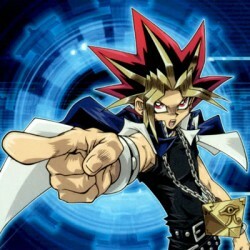 When a Trap Card is activated: Pay 1000 LP; negate the activation, and if you do, destroy it. All Speed Duel Cards contain a new marker confirming their legality for Speed Dueling. Only cards with th.. If this card is Summoned: Inflict 500 damage to your opponent. All Speed Duel Cards contain a new marker confirming their legality for Speed Dueling. Only cards with this special symbol may be used f.. If this card attacks a Defense Position monster, inflict piercing battle damage to your opponent. All Speed Duel Cards contain a new marker confirming their legality for Speed Dueling. Only cards wit..
Any battle damage this card inflicts to your opponent is treated as effect damage instead. All Speed Duel Cards contain a new marker confirming their legality for Speed Dueling. Only cards with this ..
You can only control 1 face-up "Gravekeeper's Chief". Your GY is unaffected by "Necrovalley". When this card is Tribute Summoned: You can target 1 "Gravekeeper's" monster in your GY; Special Summon th..
You can Tribute 1 "Gravekeeper's" monster, except "Gravekeeper's Cannonholder"; inflict 700 damage to your opponent. All Speed Duel Cards contain a new marker confirming their legality for Speed Duel.. When this card declares an attack while "Necrovalley" is on the field: You can target 1 face-up monster your opponent controls; change that target's battle position. All Speed Duel Cards contain a ne.. While there is no face-up Field Spell, the field is treated as "Necrovalley". All "Gravekeeper's" monsters on the field gain 200 ATK/DEF. All Speed Duel Cards contain a new marker confirming their le..